What is air? Why is the sky blue? Why do people react favorably to mountain or sea air? How does desert air differ from the air of California’s Central Valley? How is air pollution affecting plants and animals? 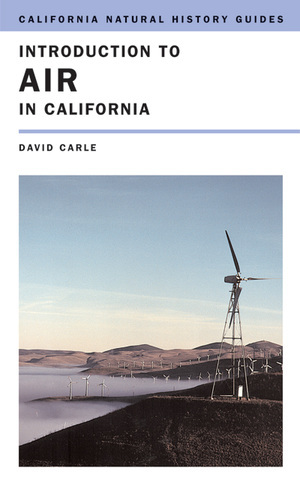 This book is a unique guide to the air we breathe in California. More than a natural history guide, it approaches this fascinating topic by recognizing the overwhelming role played by humans in the story of California’s air. In a highly engaging style, David Carle explains daily weather patterns, seasonal climate, characteristic winds, and sky phenomena. He explores air as the gases in our atmosphere, but also considers the aspects of air that influence all of our senses—its taste, smell, feel, and look. The guide discusses California’s history of air quality management, air pollution and its effect on humans and the environment, and the technological and individual measures needed to address these challenges. The book also functions as a handbook for more environmentally conscious living by providing information on alternative energy sources for consumers and tips for cleaner running cars. David Carle worked as a California State Park ranger for 27 years. He is author of Introduction to Water in California (UC Press, 2004), Water and the California Dream: Choices for the New Millennium (2003) and Burning Questions: America's Fight with Nature's Fire (2002), among other books.